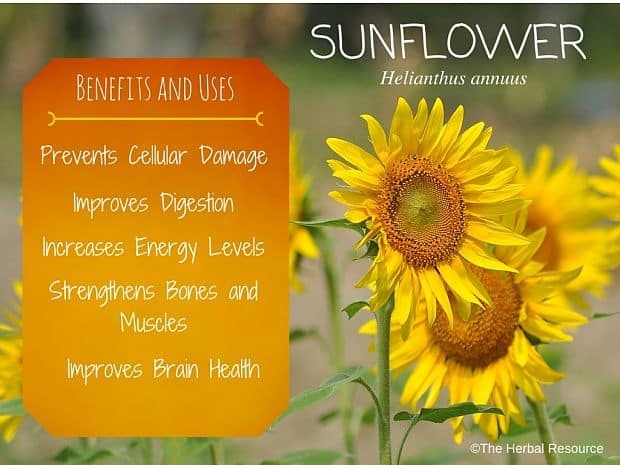 Botanical Name of Sunflower: Helianthus annuus. The botanical name Helianthus originates from the Greek words helios (Sun) and andanthos (flower). 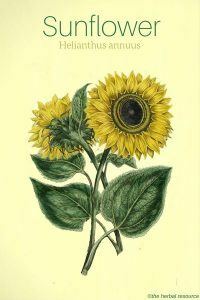 Other Common Names: Common sunflower, wild sunflower, solsikke (Danish), Sonnenblume (German), girasol (Spanish), tournesol (French). Habitat: Common sunflower (Helianthus annuus) is native to North America. It has become naturalized in many European countries and today it is cultivated on a grand scale in Russia due to the popularity of the oil produced from the plant’s seeds. Description: Sunflower is an annual herbaceous plant belonging to the daisy family, the largest and one of the most popular plants from this family. It can grow up to 4 meters in height. The root is hairy and made of fiber, and it creates plenty of spacious roots that can penetrate up to 3 meters in the ground. Due to its deep roots and ability to soak up water and harmful substances, sunflowers are often used for the drying of wetlands and cleaning of contaminated soil: waste waters, lead, and radioactive substances. The leaves are large, individual, with long stems, and heart-shaped. The stem usually develops 20-25 leaves. It flowers from June to September, and large flowers develop individually on top of the stem or branch. The center of the head is composed of small yellow-brown or red-brown tubular flowers, surrounded by yellow petals that are up to 10 centimeters long. There are two types of flowers: large petals that form a yellow wreath and small flowers that form fruit. From the center flowers of sunflower, oval and flat black and dappled fruits develop. Within every fruit, there is one light gray seed, rich in herbal oils, vitamins, proteins, and minerals. A mature sunflower can contain up to half a kilo of seeds. Plant Parts Used: The seed, flower petals and leaves. Active Ingredient and Substances: Sunflower oil and oil cakes are used extensively in the food industry as a high-quality energy food. These days, there are numerous sunflower breeds, grown for oil production and their voluminous forage. Oil is made of two types of seed: small black seeds that deliver high-quality oil and large grayish-black seeds with white stripes that are used for food. Sunflower seeds of 100 grams contain 25 grams proteins, 42 grams fat, 1 gram carbs and 4 grams herbal fiber. The energy value is 2450 kj (585 kcal). The seed contains vitamin A, vitamins from the B group, vitamin E, and of minerals, there are arecalcium, phosphorus, ironandsodium. The flower petals contain anthocyanicglycosides, xanthophyll, choline, betaine, carotenoids, phytosterines, sapogenins and sunflower acid. Since ancient times, the plant seed has been thought of as one of the best and most nutritious foods and rightly so as the seed contains almost 23% protein and all the essential amino acids in a significant volume. When it comes to fat, a sunflower seed contains 50% of multiple unsaturated fats of which the highest percentage is essential linoleic fatty acid, which is an important forerunner of omega 6 fatty acids that are beneficial for lowering the level of cholesterol in the blood. Oleic acid, as an important single unsaturated fatty acid, is also present in a high amount. A sunflower seed is highly nutritious and contains a high oil level. Just 25 grams of seeds a day will satisfy the daily body need for vitamin E.
Additionally, sunflower seeds are a great source of various minerals, such as calcium, phosphorus, magnesium, natrium, potassium, and iron. All this combined with previously mentioned vitamins makes it an excellent nutrient that would make a great addition to everyone’s regular daily diet. In the past, the sunflower was grown by Native Americans, who used to grind it into flour, add it to bread or used it to make oil. The Native Americans from North, Middle and South America appreciated sunflower seeds the most of all plant seeds. The sunflower was a symbol of the sun god because at dawn it starts to turn its flowers toward sunrise. Mayans worshiped the sunflower as a symbol of light and fertility and drank tea made of its leaves and ate the seed, stems, leaves, and petals. Aztec priestesses of the sun god were crowned with sunflowers in the 15th century, and at the beginning of the 16th century Spanish Christian missionaries brought it to Europe because they liked the flower, so at first, it was grown as an ornamental plant. It spread across Europe until the 17th century and mass production started in the 18th century in Germany and Russia and then in Western Europe and toward the Mediterranean. 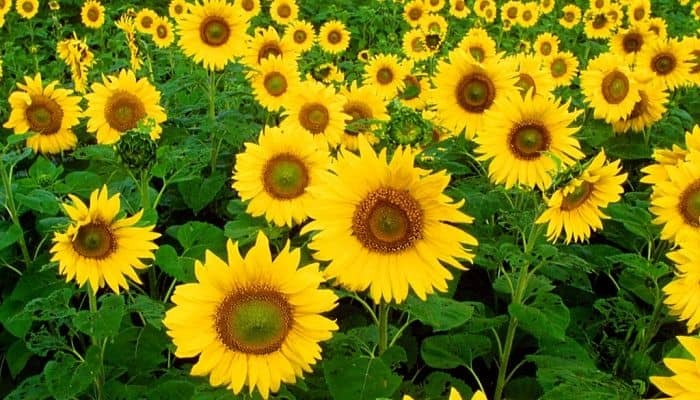 But it was not until the 1830’s that Europeans discovered that the sunflower was more than just a pretty flower when they drained the oil from the sunflower in Saratov, south Russia. Vitamin E and selenium are strong antioxidants that are thought to neutralize free radicals and thus protect the body from numerous diseases such as cardiovascular diseases and malignant cancers. Vitamin E is important for brain functions. It is also considered that sunflower seeds help with increasing sexual power, improve digestion, enhance energy levels, strengthen bones and muscle and work against infertility and can even help with multiple sclerosis. Sunflower seeds are one of the best sources of phenylalanine, a substance that helps prevent pain due to its anti-inflammatory and analgesic effect. It is also recommended as a herbal remedy for arthritis. Decoction prepared by cooking seeds for 20 minutes has been used traditionally against cough and kidney inflammation. The sunflower petals are used in herbal medicine for the preparation of tea and tincture; it has a bitter and strong flavor and the smell of honey. Tea and tincture prepared of the petals are believed to be very effective in the case of a sore throat and to reduce inflammation of the windpipe and tonsils. The sunflower has an important role in the kitchen because its seeds are rich in proteins almost as much as a meat. The seed can be eaten raw, dried and fried. The seed is used to prepare different spreads with tofu and some vegetables. It is perfect to add to a bread or pastry. The seed is also recommended as a worthy addition to breakfast with fresh fruit or fresh cheese. Sunflower seeds can also be added to the main meals, for example to soups or salads; they are used in cakes, fruit salads, and other desserts. Grounded seeds can be added to broths and gravy as well as an addition to morning granola and muesli. When it comes to the use of sunflower seed oil, it is best to use cold-pressed oil in preparation of salads or vegetables. With such preparation, the amount of unsaturated fatty acids is not decreased, which tends to happen when the oil is hot-pressed. The flower petals can also be used for the preparation of wine: 80 grams of dry petals should be covered with 1 liter of white wine and left to stay for 15 days, stirring occasionally. The petals can be used as a sprinkle for salads, sandwiches, or pasta. The dried leaves have also been used as a replacement for tobacco. For the preparation of sunflower petals tincture: 3-4 spoons of dry petals should be put in a smaller glass jar with a wide neck and covered with 2 dl of 70% alcohol, and then close firmly. Leave at room temperature and occasionally stir. After 3-4 weeks, strain and keep in a dark bottle. Take 1 teaspoon 2 times a day, dissolved in a little bit of water or tea. Sunflower is usually regarded as a safe herb or plant to use, be it as oil, food or medicine. People with known allergy to plants in the daisy family should be cautious when using the plant. Phillips KM, Ruggio DM, Ashraf-Khorassani M: Phytosterol composition of nuts and seeds commonly consumed in the United States. J Agric Food Chem. 2005. Meyer, Clarence: American Folk Medicine, Meyerbooks, Glenwood, Illinois, 1973. Vogel, Dr. H.C.A. : The Nature Doctor: A Manual of Traditional and Complementary Medicine, Keats Publishing New Canaan, CT. Verlag A. Vogel, Teufen. Switzerland 1991. Lust, John: The Herb Book, Bantam Books, New York, NY. 1974. Hutchens, Alma R: Indian Herbalogy of North America, , Shambala Publications, Horticultural Hall, Boston, Massachusetts, 1973.